Most Noble Marquis of Abergavenny; Sotheby's, London, 10 July 1986, lot 61. Henrietta Pelham was the daughter of Thomas Pelham, of Stanmer, Sussex and sister of Thomas, 1st Earl of Chicester. She married the Hon. Richard Temple and after his death George, 17th Baron and 1st Earl of Abergavenny (1727-1785) on 5 February 1753, she died on 31 August 1768. We are grateful to Mrs Evelyn Newby for suggesting that the sitter is shown in masquerade dress and the emphasis placed on the large pearl hanging from the blue ribbon around her neck implies that she was dressed as Cleopatra, who dissolved a pearl for Mark Anthony. 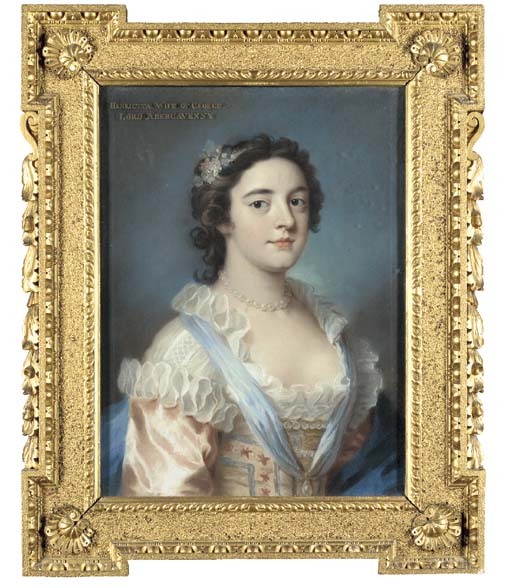 The flower spray in her hair is almost identical to the treatment in a signed portrait by Hoare (Private Collection) and the drawing of the pearls corresponds closely to Hoare's portrait of Lady Fitzwilliam in the Fitzwilliam Museum, Cambridge. The portrait dates from the mid 1750s and may be connected with Lady Abergavenny's wedding in 1753.